tl;dr: We won some amazing Keysight gear (and software!) in a contest. They’re running the contest again with an even sweeter prize pack, and entries close in a few days. It’s the real deal and you could win some crazy stuff for yourself or your space. Go enter here, right now. That’s a seriously nice bench full of equipment, and when I looked at the sweepstakes, I figured there were two likely outcomes: It would either be won by a student/hobbyist, who would surely appreciate it but might not find time to use it often (or to its full potential), or by a professional designer with access to similar stuff in a commercial lab. However, that’s not how it turned out! If you’re reading this, you know there’s a third possibility: That the prize might go to a hackerspace/makerspace. Run by and for the DIY community, i3Detroit’s member-volunteers have spent the last 6 years sharing resources and inspiration, with an almost-impossibly-broad scope: A visitor will find the expected laser cutters and 3D printers, but also embroidery and jewelry equipment, woodworking, welding, ceramics, and a dozen other disciplines represented, all under one roof. 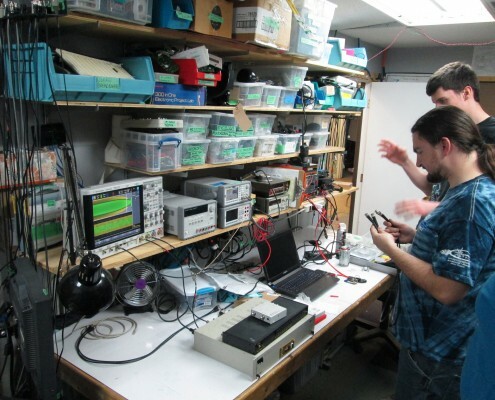 Not least of which is an electronics lab which just got a pretty significant equipment upgrade. This breadth of capabilities is reflected in the diversity of membership, too: Costume designers collaborate with radio engineers to make remote-controlled animated wearable art. Traditional wood marquetry techniques get a boost from laser speed and precision. Lasers do a great job on leather, too, and another ancient art moves into the 21st century. A handful of successful crowdfunded projects have made their prototypes or production hardware here, and independent inventors and entrepreneurs find a place in the community too. On any given day, the oscilloscope’s VGA-out might be hooked to a projector, so music-synth students can see the instructor’s waveforms on the big screen. The next day, it might be in math mode, working with the function generator to characterize the frequency response of an amplifier or filter. Just yesterday, the PSU and DMM were paired up on either end of a little power converter, getting final alignment before going into a prototype phone accessory. Tools at i3Detroit get a workout! What will you do with them next?